The wedding reception was at Crystal Gardens in Southgate Michigan. The wedding went great, they have a fun family. Dave and Kristina also went with Basel of Precious Memories Photos for their photography, and they always do a stellar job. Since we’ve done this reception we have had the chance to really get to know this couple. Not only have they referred us to their family and friends, but they are also planning on using us for their vow renewal. The couple had a very large bridal party, and their maid of honor gave a very touching speech before dinner began. What I really loved about this reception was the fact that we took amazing photos from the reception. I have atleast a dozen great images from during the dancing part. I loved the footage so much from the video that we still use it to this day. I love doing parties like these because it gives me such good memories. The client really wanted a lot of interaction, so we had some fun with the guests. Did a variety of music including the Frank Sinatra New York can can. I think we had at least two hundred people in a circle giving the rockets a run for their money. We played a variety of music throughout the reception, for the grand entrance we did Beyonce Crazy in Love & Jagged Edge Let’s Get Married. The parent dances included Heartland and Ronnie Milsap. For the bridal party we mixed it up a little bit by doing the Cha Cha Slide. The cake cutting song was a little traditional with James Taylor How Sweet It Is. They decided to skip the garter. It seems a more common nowadays to skip these traditions. Since it is done at every wedding, some people will consider this a little cliche. Kristina still wanted to toss her bouquet, so she chose Kelis Milkshake. My favorite part of the night is how everyone reacts after the reception. When people come up to us after-wards and thank us for how much fun they had, it makes the night perfect! Both Dave and Kristina only had positive remarks. 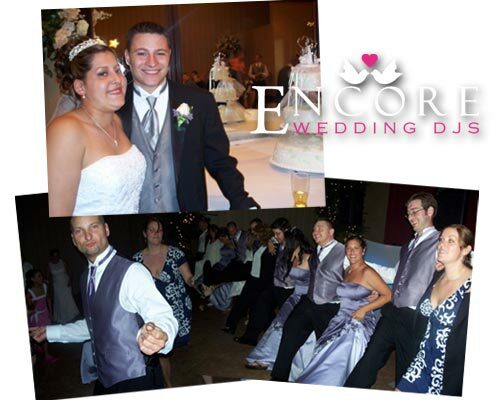 The client agreed to give a video testimonial afterwards about their experience with Encore. Also we took a bunch of great shots during the reception. Thanks Dave and Kristina for having our wedding DJs in Southgate rock your wedding reception!